If you’ve ever wanted to look dapper, there’s one question that’s surely entered your mind — Should I use a shaver, or a trimmer? It’s natural to have some confusion about this topic. After all, both tools perform similar jobs — removing hair. And both are pretty popular in today’s market. But the similarities really do end there. When it comes to shaving, both of these tools perform their jobs quite differently. And you’ll also find the prices vary pretty heavily as well. But even with this in mind, the big question still looms — are trimmers better than shavers? Surprisingly, this question does have an answer — but it can be pretty complex. So we’re here to help today by answering that question. So if you want to know what to buy for your daily grooming habits, join us as we explore the differences between shavers and trimmers. 1 What’s Better Between Shavers and Trimmers? 2 Should I buy a trimmer or a shaver? 3 Can a Shaver be used as a Trimmer? What’s Better Between Shavers and Trimmers? This tool will allow you to shape your beard and hair however you please. You can always achieve a smooth shave with a trimmer. Don’t worry about hurting yourself—it’s almost impossible to cut yourself with a trimmer. You can achieve some precise and detailed lines, contours, and angles in your beard. Trimmers allow you to personalise your own look. So you can shave based on your attire for the day or situation. Trimmers are a pain to clean. In most cases, you’ll spend some time brushing out all those small hairs. You’ll need some length and density to your beard to make use of a trimmer. These aren’t just for your face. Trimmers also work great for your chest, armpits, pubic regions, and even touching up the hair on your head. Trimmers cut hair above the skin. This leads to less irritation. Save time — you can shave with a shaver in a matter of minutes (if not seconds). You can shave any length of hair — great for stubble or a few days worth of growth. In general, shavers are ideal for larger surface areas — keep this in mind when it comes to your face, legs, back, etc. With electric shavers, it’s pretty tough to edge and detail. You’ll need to replace the blades after so much time (usually a couple years). Shavers will remove hair from your skin pores—so hair gets a closer trim. Generally, shavers will cost more than trimmers. You can use moisturisers and gels before and after use for your skin. Many are waterproof — so you can shave in the shower. Shavers aren’t as adept at cutting long hair — after a certain point, you’ll want to trim your hair before shaving. Shavers will exfoliate your skin, keeping it healthy. Should I buy a trimmer or a shaver? So, after reviewing the above information, you’re probably wandering that same question again — which is better for you? Overall, you can tailor the answer to your own preferences. Especially since shavers and trimmers are pretty opposite from each other. So with this in mind, here are the big questions to consider. Where do you plan to shave? If you’re planning on detailing a beard, or getting those annoying little chest hairs that peak their way out of the collars of your shirts—then trimmers will help you out here. Little will detail a beard quite as well as a trimmer. Plus, it’s often as simple as plugging in and going. Even better—when the hair gets too long, trimmers won’t painfully tug and pull at hair like shavers. On the flipside, if you mainly plan on shaving the hair on your face frequently, then a shaver will work well for you. Overall, shavers work great for short hair. And since they quickly remove all hair from your skin, you’ll be saving quite a bit of time as well. Are you detailing or removing? So if you’re planning on adding some depth and detail to your beard, then a trimmer will hands down get the job done. Keep in mind that many trimmers will even come with different combs to trim your hair to different lengths. This is perfect for creating that fade effect on any facial hair. On the other hand, shavers work great for outright removing all hair. So if you want that fresh clean-shaven look, a shaver will do just that. Plus, if you shave frequently, you’ll find shavers can cut those shorter hairs without much effort. How frequent do you plan to shave? Realistically, both of these tools can be used on a daily basis. So if you plan on shaving daily, consider how much hair you plan to remove. By now, you probably have it memorised — if you’re removing all facial/body hair, go with a shaver. If you’re detailing or removing longer hair, go with the trimmer. But, if you don’t like shaving daily, a trimmer might be for you. Hair grows at different rates for everyone. But after so many days, your hair will grow too long for a shaver. So if you don’t want painful pulling and tugging, consider a trimmer. Overall, shavers will cost more. In fact, it’s not uncommon to see electric shavers exceeding £200. Meanwhile, electric trimmers can be found as cheap as £20. And that’s just the starting investment. Remember, if you buy a rotary shaver, you’ll need to change the blades after so many months—so you’ll continue paying for the shaver even after the initial purchase. But this isn’t necessarily a bad thing. If you need the daily close shaves, then you’ll probably find the investment is worthwhile—especially with the time you’ll save. Can a Shaver be used as a Trimmer? By this point, you’ve probably figured out that trimmers can be used as shavers. Sure, it will take you a lot more time—but it can be done. But what about the opposite—can a shaver be used as a trimmer? Well, we’re not going to say it’s impossible, but we really don’t recommend it. 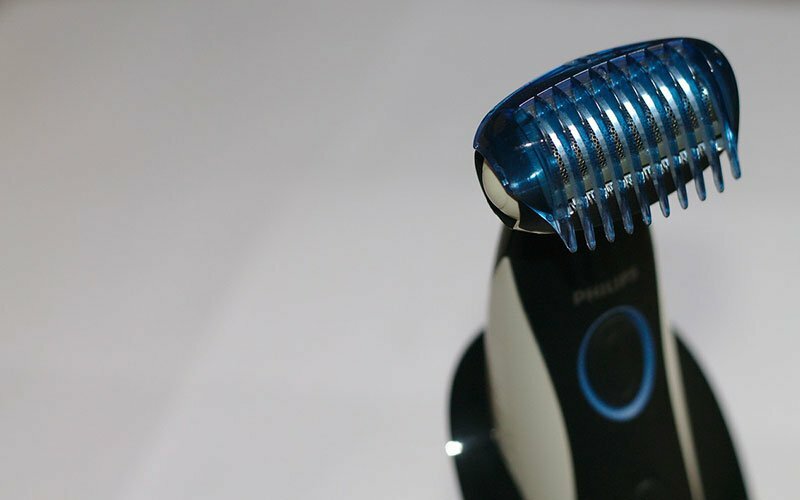 As a whole, electric shavers do one job really well — and that’s removing hair from below the skin. Trimming those hairs above the skin is tricky. And if you want that added depth and dimension from a trimmer — you’re looking at an even harder job. Unlike trimmers, shavers usually won’t come with combs to help you determine the amount of hair you’ll shave. So you’ll struggle to sculpt that precise beard that’s trending today. When it comes to shaving, you have plenty of options. Do you shave all facial hair entirely—or do you sculpt a suave and sophisticated beard? The choice is yours. But you’ll really want to buy the right tool for the job. Remember, shavers and trimmers are both fantastic tools. But you’ll need to decide on the one that’s right for you. So consider the look you want to achieve. And then, consider which option works best from there. A dapper look lies within your next purchase—so make your choice carefully.